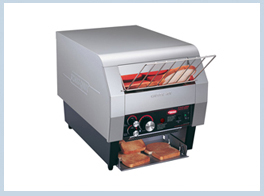 Give customers perfectly toasted bread slices, buns, Texas toast and English muffins every time with this Hatco TQ-1800H Toast Qwik conveyor toaster! This toaster relies on conveyor speed to regulate the color and texture of the finished product while infinite controls regulate top and bottom heat, making it simple to adjust the color and texture during operation. It also boasts a color-sensing system to maintain consistent results slice after slice, and since it can produce up to 1200 bread slices per hour, this model is sure to keep pace at even the busiest breakfast buffets. Additionally, a power-save mode works to save you energy during off-hours.